Marion North Carolina and the gorgeous Western NC Real Estate properties that we sell are located nearby to numerous protected and managed scenic areas. The Blue Ridge Parkway, the Linville Gorge Wilderness Area, and the Pisgah National Forest all surround our NC Mountain Vacation Rentals in the Blue Ridge Mountains and border our NC Blue Ridge Mountain Real Estate. These unspoiled regions border our North Carolina Mountain Properties for Sale and create stunning, picturesque locations and provide an assortment of fun things to do. 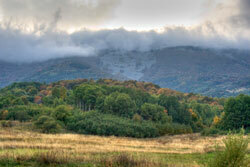 At Blue Ridge Realty we can help you find the mountain home of your dreams nearby to these scenic, mountain areas. Learn more about each below and contact us today! The Blue Ridge Parkway is perhaps one of the best known scenic byways in the North Carolina Blue Ridge Mountains. Stretching through the Southern Appalachian Mountains found in Virginia and Western North Carolina, the Blue Ridge Parkway offers the finest in North Carolina Mountain living and fun. The gorgeous stretch of Blue Ridge Parkway that meanders through our region features many overlooks, turnouts and hiking or picnicking spots. Featuring great places to hike, mountain bike, horseback ride, and fish, the Blue Ridge Parkway is a place of spectacular beauty where the outdoor activities abound. Drive or hike along and take notice of the beautiful blooms that come with each season. Several native species of mountain wildflowers are found on the Blue Ridge Parkway, creating some of the most beautiful locations in our Western North Carolina Mountain region. Browse our Blue Ridge Parkway Homes to find Western NC Real Estate and properties along the Blue Ridge Parkway. At Blue Ridge Realty we also offer our Cabins on the Blue Ridge Parkway, some of the best Blue Ridge Parkway Lodging you�ll find. The Linville Gorge Wilderness region is the third largest managed wilderness area in North Carolina, and a famous spot commonly called the Grand Canyon of the Blue Ridge Mountains. Nestled in the Pisgah National Forest near our Linville Cabin Rentals, the Linville Gorge Wilderness Area was carved out by the ancient Linville River. Here visitors can hike, bike, rock climb, fish, and enjoy the abundant native wildlife. Known for its native species, this area is home to bear, fox, raccoon, mountain lion, deer, owls, eagles, hawks, and even falcons! Both Linville Falls and Linville Caverns are popular mountain attractions found in the Linville Gorge Wilderness and are great places to explore. Spend the day on an adventure and venture out into the Linville Gorge Wilderness Area, and be sure to bring your camera. The Pisgah National Forest covers over a half million acres of Southern Appalachian Mountains and crosses through our scenic, mountainous region in McDowell County North Carolina. Here some of the highest peaks of the Blue Ridge Mountains tower above the green valleys below. Encompassing several beautiful communities including those found in McDowell County, the Pisgah National Forest is home to several popular mountain attractions including: Mount Mitchell, Craggy Gardens, Roan Mountain, and the North Carolina Arboretum. Visitors to our NC Blue Ridge Cabin Rentals love being surrounded by the Pisgah National Forest�s unspoiled scenery and the abundance of hiking, mountain biking, horseback riding, and fishing spots in the region. Managed by the United States Forest Service, the Pisgah National Forest has two ranger offices, one located in Pisgah Forest, and the other in the town of Nebo North Carolina. If you have any questions or would like more information,please call us at 828.756.0020 and 828.460.0123, email us, or use our online request form. Copyright � 2008 Blue Ridge Realty & Associates. North Carolina Web Design by AppNet.com.